Across college campuses in the ‘70s, teachers and students engaged in a battle of their own – making education relevant. Written specifically for The Bats, this World Premiere tackles the Great Books curriculum and puts dead white men to the test. The show features two rotating casts of Bat Company Members Holly Chou, Louiza Collins, Tommy Crawford, Bjorn DuPaty, Katherine Folk-Sullivan, Andy Gershenzon, Raúl Sigmund Julia, Betsy Lippitt, Maren Langdon, Turna Mete, John Russo and Wilton Yeung. The design team includes Kate Sinclair Foster (sets), Jeanette Yew (lights), Jessica Pabst(costumes), Jill BC DuBoff (sound) and David Prittie (projections). A.R. Gurney has been writing plays for over fifty years. Among them are: The Grand Manner, Scenes from American Life, The Dining Room, The Middle Ages, The Cocktail Hour, Love Letters, Sylvia, Far East, Ancestral Voices, Big Bill Indian Blood, Crazy Mary, and Buffalo Gal. At The Flea he has premiered Post Mortem, O Jerusalem, Screenplay, Mrs. Farnsworth and A Light Lunch. He has also written three novels, a few television scripts, several unproduced movies, and the librettos of two operas. Gurney is a member of the Theatre Hall of Fame and the American Academy of Arts and Letters. He has honorary degrees from Williams College and Buffalo State University, and taught literature at M.I.T. for many years. 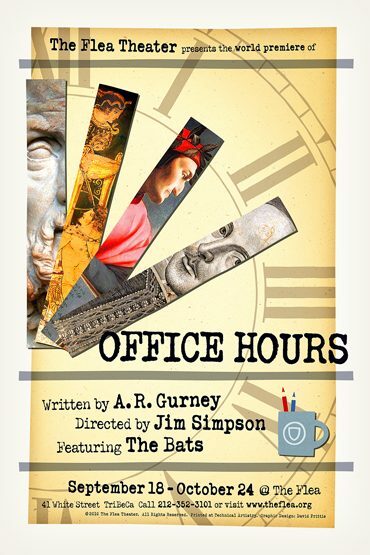 OFFICE HOURS runs September 18 – November 7. Tuesday – Saturday at 7pm, Saturday and Sunday at 3pm and Sunday, September 19 at 7pm. Tickets are $25 and may be purchased by clicking the red TIX link above. Tickets may also be reserved by phone at 212-352-3101. For Group Sales – of groups or 10 or more – please call 212-226-0051, ext. 101. Pay-What-You-Can tickets are available at the door only, starting at 6pm each Tuesday performance. Limit one ticket per person. Please note there are no refunds or exchanges.